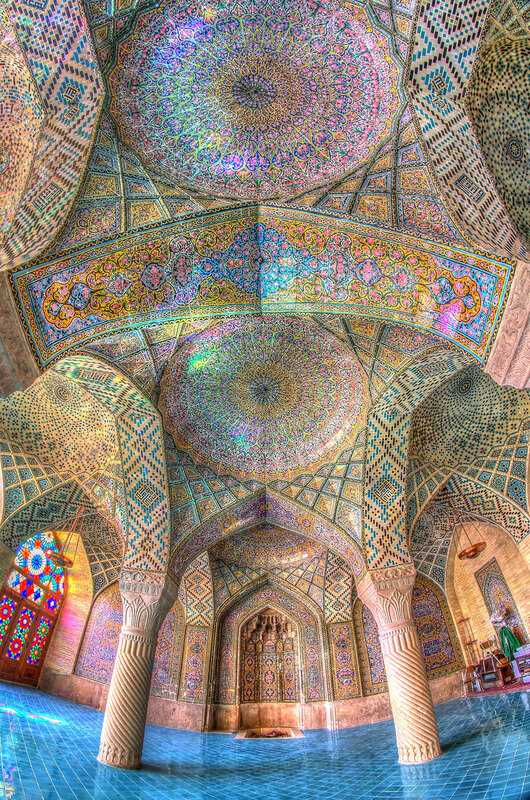 Discover ceilings from buildings inspired by Islamic architecture where looking up is a spellbinding experience! Each has a design and a story of its own. Most of them are distinctive and unique in respect of their architecture and hold outstanding features. Opened in 2007, Architect's name is Yusef Abdelki. Architectural style is both Mughal and Moorish. Sheikh Zayed Grand Mosque is located in Abu Dhabi, the capital city of the United Arab Emirates and is considered to be one of the key mosques for worship in the country but is also the number one mosque destination for tourists to the country. It boasts Mughal and Moorish architectural styles. On the internet it is mostly shared as Al Soltan Qalawoon Mosque(*) but some Egyptians claim this is Sultan Barquq Mosque and Madrasa (*). Opened in 2007. Built by Jalil Hayat. Architectural styles are Egyptian and Ottoman. Jalil Khayat mosque, which resembles in style the Muhammad Ali mosque in Cairo and the Blue mosque in Istanbul, was inaugurated in Erbil on January 19, 2007, after being under construction for many years. Jalil Khayat, one of the more well- known, wealthier people in Erbil, had the mosque built. His sons proudly took over the project after Khayat passed away in 2005. Haji Dara, one of Khayat’s sons, expressed happiness that they could complete this “charity project” and witness the first Mawlood in their new mosque. Above photo shows the Honey Comb Dome in Hall of the Abencerages. One cannot discuss Muslim Spain without referring to the famous Al-Hambra Palace in Granada. Its origins are still under debate as most scholars dated it to 13th century Granada, but there are indications which suggest it was first built in the 11th century - a significant time for both Muslim and European architecture. (Also "the first historical documents known about the Alhambra date from the 9th century and they refer to Sawwar ben Hamdun who, in the year 889, had to seek refuge in the Alcazaba, a fortress, and had to repair it due to the civil fights that were destroying the Caliphate of Cordoba, to which Granada then belonged..."*). The palace complex briefly consists of series of apartments, halls and courts organised in a delightful interconnected setting of hierarchy. The palace is an architectural masterpiece in every term. The successions of spaces are clearly defined by boundaries and each space contains identical features enhancing its identity as well as its function.